Best Particle Therapy, Inc. is a relatively new member of the TeamBest® family of companies, founded by Krishnan Suthanthiran in 1977. TeamBest® currently offers products for brachytherapy and teletherapy. Best NOMOS, a TeamBest® company, invented IMRT (intensity-modulated radiation therapy) in the early 1990s. TeamBest® continues to expand its product offerings to cover low tech to high tech with the primary goal of making these technologies affordable and accessible globally. Best Particle Therapy will utilize advanced state-of-the-art accelerator technologies and provide cost-effective solutions for particle therapy treatment and research. “Particle Therapy” (PT) is a radiotherapy technique that utilizes hadrons and was first proposed by R.R.Wilson in 1946 after analysis of inverted depth-dose distribution measured at the Berkeley Cyclotron. This analysis resulted in the first radiological use of hadrons in 1954 by Cornelius Tobias and John Lawrence at the Radiation Laboratory (former E.O. Lawrence Berkeley National Laboratory, LBNL). This pioneering work explored the use of hadrons, i.e., protons, deuterons, helium and neon ions, for therapeutic exposure of human patients and concluded at LBNL with the shutdown of the BEVALAC in 1992. Inspired by the success of the early work in the USA, international efforts were made to develop particle therapy into a mature radiological treatment modality. 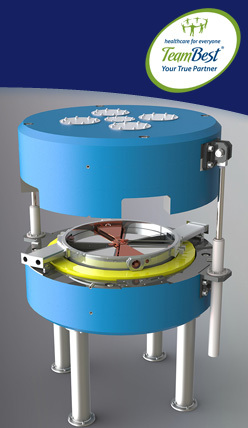 Advanced accelerator technologies that promise to deliver affordable proton and carbon ion beams with uncompromised precision. Treatment Planning System by Best Nomos. Online image guidance to assure co-registration of delivered particle beams with target volume. 3D Dose Verification used to optimize treatment plan and tumor control. The following illustration summarizes the different types of radiation used in various radiotherapy techniques. The different types of radiation are characterized as photons or charged particles. The most common internal and external radiotherapy techniques utilize X-rays and gamma rays, both of which are identical to photons with extremely short wavelengths capable of causing ionization and are therefore called ionizing radiation. It is worth mentioning that gamma rays are, in fact, identical to X-rays but have been given a unique name to identify them as originating from nuclear decay. Because protons and carbon ions have mass unlike photons, a charged particle is characterized by an inverted depth-dose distribution (the so called Bragg peak), which is most favorable for deep-seated target volumes. The main criterion used in all radiotherapy techniques is to deliver a sufficient dose to achieve tumor control while minimizing side effects. This challenge requires an ongoing understanding of the biological effectiveness, as well as high precision in conformity. While X-rays and protons have similar Relative Biological Effectiveness (RBE), protons offer the physical advantage of having a limited penetration depth governed by the laws of physics. The actual range at which the particle stops is strictly dependent on the kinetic energy of the particle, and therefore facilitates the possibility of a treatment plan without any significant distal dose. Quite often pristine Bragg peaks are presented to illustrate advantages of particle therapy; however, such pristine depth-dose distributions have little value in practice since a Spread Out Bragg Peak (SOBP) after range stacking is necessary to fill in a tumor volume. The dose distributions for X-rays and SOBP for protons and carbon ions are shown below after considering biological effects. The dose distributions clearly illustrate the advantages associated with particle therapy by the elimination of the distal dose. It is worth pointing out that X-rays can often achieve excellent conformity using IMRT techniques or implanting very low energy gamma ray sources; but the unmistakable advantage of particle therapy is associated with precise control of particle penetration depth. 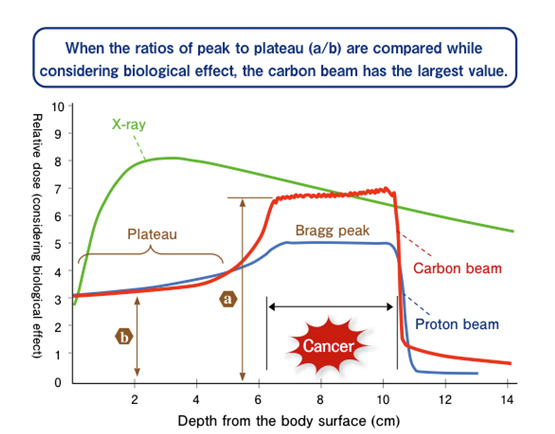 Because of the greater mass of carbon ions, multiple scattering and range straggling is approximately 3 times less than protons, resulting in a sharper lateral and longitudinal edge; it is therefore ideal for treatment of deep-seated tumors, where penumbra becomes a limiting factor. 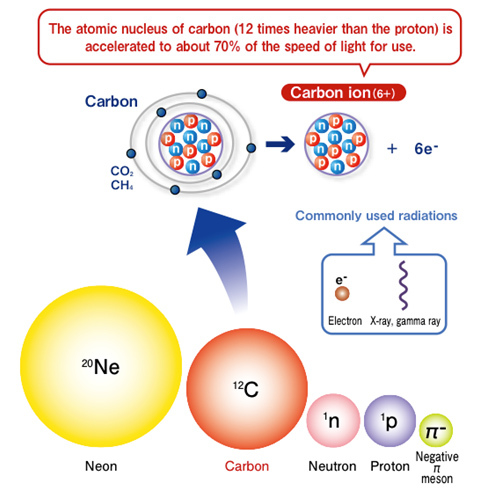 Since the Linear Energy Transfer (LET) in the peak of a carbon beam is larger than that of photon and proton beams, the Relative Biological Effectiveness (RBE) is 2 to 3 times greater for carbon ions. Therefore, carbon ions have enhanced therapeutic benefits in treating radiation-resistant tumors. Fragmentation of carbon ions produce a tail in the dose distribution after the Bragg peak (see illustration), which contributes to a small but finite distal dose. These carbon fragments can be a nuisance in certain cases; however, they are also indicative of the production of a large number of in-situ positron emitters throughout the entire treatment volume. In comparison with proton therapy, carbon therapy results in a greater level of detectable activation with less uncertainty, facilitating online monitoring with PET and the advantage of 3D treatment verification. Best Particle Therapy will deliver energetic particle beams of protons and carbon ions with the highest level of precision to treat deep-seated as well as radiation-resistant tumors.